Drug dealers and taxi cabs go together like peanut butter and jelly. It doesn’t matter if it’s cocaine, heroin, crack, methamphetamines or marijuana, the safest way to transport and distribute all forms of contraband is a licensed taxi cab. I’m not a drug dealer, and have no desire to ever be one, but over the past 6 years, I’ve been exposed to as many drugs, drug dealer stories, and sometimes the drugs themselves as I was during the 1960’s, when I was actively seeking them. It was a slow eye opening process, but after talking to former cab drivers, who actively sold and distributed drugs, and finding out that some of my passengers were drug dealers, I had all the information that I needed to make an ID, when my instincts smelled a rat. “I was using an 8 ball of crank every other day,” he said. “Okay, then it was possible,” I said. He said that he got fired, because he wanted a night off, and after they refused to give it to him, he took it off anyway. The entire story sounded ridiculous, but it wasn’t the first time that I was told a similar tale, by a former A-Cab driver. One of the strippers that I used to regularly drive, who had worked in Las Vegas, told me that all the hacks in Vegas are either drug dealers themselves, or can turn you on to whatever you want. Then she told me that every time that she rode with A-Cab, the driver would try to deal her drugs. “They think that because I’m a dancer, that I use drugs, and I don’t,” she told me. A licensed cab driver can pick up and drop off people, after exchanging money, without suspicion. It’s common to pick people up, and drive them on a round trip to a grocery or drug store to buy beer or pick up a prescription. So it would be just as easy for them to call the cab driver on his cell phone, tell him what drug they wanted, and then call the cab dispatcher to personally request the drug dealing cab driver to pick them up for a beer run. 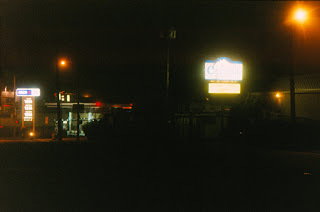 The biggest drug dealer that I ever drove was Hank, who lived in the Oregon Capitol Inn, located on the North West corner of Mission and Commercial, next to the Arco station, before they tore it down and build half million dollar condominiums. Hank worked at a small independent grocery store that was located in one of the bad sections of town. There had been a murder take place in front of the store a few years back, and in a separate incident the owner was accused of pedophilia. Hank took a cab there 7 days a week, and his starting time varied from 12:00 Noon to 4:00 PM, although the market itself closed at 10:00 PM. He was always there at least 8 hours, if not longer. Sometimes he would have me deliver meals that I picked up at Denny’s, at around Midnight, to the back door of the market, where he would pay me, and he always tipped at least $3.00. When I would drive Hank to or from work, sometimes he would tell me about business opportunities that I could invest in that would be guaranteed to double or triple my money within 6 months. “Do you know anyone who has $30,000.00 or $40,000.00 that they would like to turn into 100 grand in 6 months,” he would ask. Then other times he would tell me about the prostitutes that lived next door to him, at the motel. One time he pointed out a blonde riding a bicycle down Portland Road, at Midnight, as being one of the hookers that he sometimes helped out, when her boyfriend beat her up. “My girlfriend and I let her sleep in the extra bed in our room, but we always change the sheets, after she leaves,” he told me. Then another time he told me that a few years back, he inherited $80,000.00 after his mother passed away. “I blew it all on drugs and booze, and in less than a year, I had nothing left,” he exclaimed. One of the last times that I saw him was when I picked him up at his room. When I knocked on the door, and he opened it, his expression was one of paranoia. Behind him I saw two attractive women kneeling on the bed, with a man sitting in a chair backwards, facing the bed, and their eyes were all on me, with the same paranoid expression of apprehension. “Your cab is here,” I told Hank. “I’ll be out in a minute,” he told me, as he closed the door. After a couple of minutes he came out with three heavy suitcases, that he wouldn’t allow me to touch, but loaded them in the trunk and back seat. When we got to the market, he unloaded them and gave me a $10.00 bill to cover the $6.50 fare, like usual. That was the last time that I saw Hank. One day, about a year after I last saw him, I was driving a passenger past the market, that I used to take Hank to, and my passenger laughingly commented on all the crime that took place at that neighborhood store. When I mention that I used to drive a guy that worked there, who I hadn’t seen in a year, he asked if the guys name was Hank? When I told him yes, he told me that he was in prison now, for selling drugs out of the store. Menlo Park taxi cab are the one who will make you reach to the venue in time and with grace. Their drivers are experienced and expert in various languages such as Japanese, English, French and many more. I only studied Greek and Hebrew, but never Latin. Drug dealers and Taxi Drivers in SOME AREAS.. or do you also say all blacks steal and do drugs, all whites are rich, all Jews are cheap, all Mexicans are drug dealers ? Say no to drugs. Detroit airport taxi is a registered company. We always obey the rules. Some taxi drivers are also use drugs and they always try to help the drug dealers. Our company Detroit airport taxi is a registered and our staff is very experienced and polite manner.